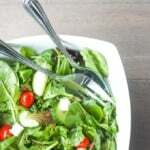 We are in full spring mode, which means time to start transitioning into lighter meals. My new discovery and my new favourite ingredient to add to any salad is buckwheat. This stuff turns regular salad into a meal. So I did just that to create my new favourite salad: the best, colourful and light, buckwheat salad with feta and tomatoes. This buckwheat salad is basically my ideal weekday/night meal… it’s perfect for a healthy work lunch or a light dinner. 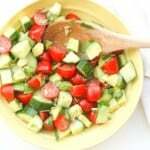 The buckwheat keeps you full, while the tomatoes, cucumber and onion bring so much freshness to the salad and add just the flavour I was looking for. I actually just recently discovered buckwheat, which is a highly nutritious seed that is high in protein and fiber. It contains loads of vitamins and minerals and boasts numerous health benefits. Plus, despite it’s name, it’s gluten-free! That’s right, buckwheat is not a grain. Buckwheat is also really easy to prepare. It only takes about 10-20 minutes too cook (depending on the package instructions). So what are you waiting for? 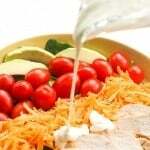 It’s time to try this superfood in the best buckwheat salad with feta and tomatoes! If you are up for an extra touch of herbs, add some fresh mint of flat-leaf parsley and enjoy! 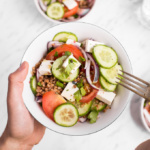 Fresh, colourful and light, the best buckwheat salad with feta, tomatoes, cucumbers and onions is the healthiest lunch or dinner this season. Loaded with superfood buckwheat, it’s gluten-free and packed with protein, antioxidant, vitamins and minerals. Cook buckwheat according to package instructions (approximately 10-20 minutes, depending on instructions). Drain on a colander and let it cool completely. Transfer cooled buckwheat to a large bowl and add all remaining ingredients. Toss to combine. 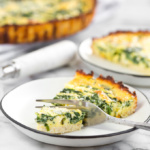 Serve with some parsley or mint on top (optional). If you’re not a big fan of feta cheese you could try using grilled halloumi or a mild, crumbly goat’s cheese instead. Try not to use very watery tomatoes. If you do, I would suggest to put the sliced tomatoes in a colander (tossed with some salt) to drain out some of the excess water prior to tossing them in the salad. oh this looks really yummy! 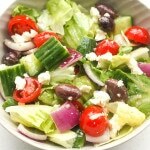 It gives me a greek salad vibe but without the lettuce. I need to try this. I’ve been looking for some lighter recipes for summer. My daughter needs to eat gluten free. I know in my head that buckwheat is gluten free, but the name sure scares me! Why did they have to put wheat in the name? I’m going to have to try it. I absolutely love buckwheat but have never made a salad out of it! Need to give this a try!